La Maison des Cochers - 2nd floor Apartment. You will be charmed by this tastefully decorated 1 bedroom apartment (located on the 2nd floor of the townhouse, there is one apartment per floor). A 18thC townhouse, combining old and new styles for (what we believe is) a tasteful result. We have paid particular attention to the confort of our guests when choosing such essential elements as the beds and furnitures. - Bakery, newsagent, supermarket (open 7am-10pm) Mon-Sat, delicatessens, boutiques. We spent 8 nights in Maison des Cochers. The apartment was clean, modern, and very comfortable. Pascale is a perfect host - attentive and helpful and very friendly. We really enjoyed our 4 night stay. The property is very well located for all the sights in Amboise, and is clean, well presented, with all necessary amenities. Pascale was also very friendly and good at replying to emails. I’d definitely recommend this property. Merci beaucoup to Pascale for welcoming us to our Loire Valley vacation! Amboise is a lovely town and everyone was so kind. Must visit La Cave on Rue Nationale for wine tasting, so friendly and helpful. Loved it all! 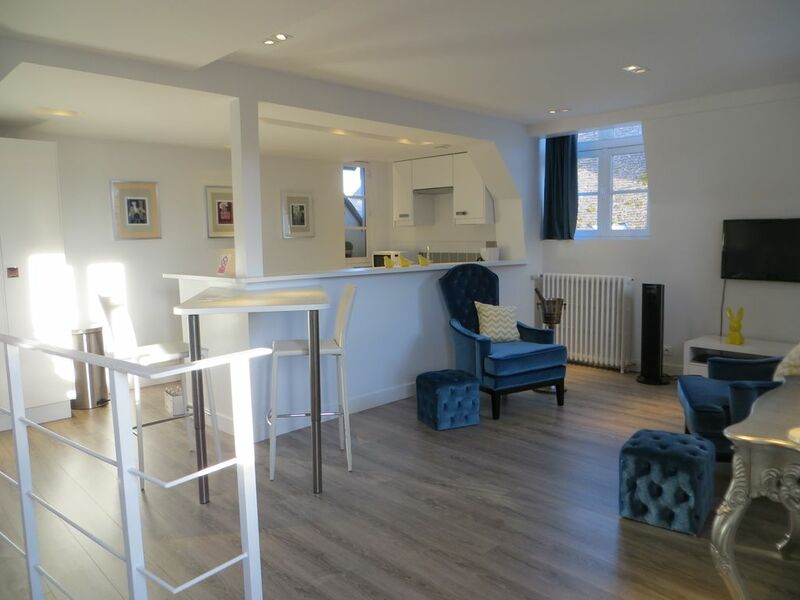 The apartment in the venerable coach house on Rue Nationale is perfect for a couple to experience the joy of Amboise. The flat is ultra modern, with all of the conveniences you could ask for. The two flights of stairs may be an impediment for some, but we had no difficulty. Pascale was very helpful, right there to meet us when we arrived, and point out where we could conveniently park our car. I would recommend this flat to anyone. This little apartment was precisely what we hoped for, cozy but with full amenities. Clean and modern. And the location was perfect, right on a main pedestrian street in Amboise. We spent four nights here and loved each of them. Beyond the apartment, however, was our host Pascale, who went above and beyond to be gracious and accommodating. We truly felt like honored guests, and it was helpful for two English speakers to have a local who could give recommendations in our language. Thanks for making our vacation exactly what we hoped! We enjoyed our staying in Amboise very much and this apartment was perfect. Pascale is amazing - so helpful and accommodating.